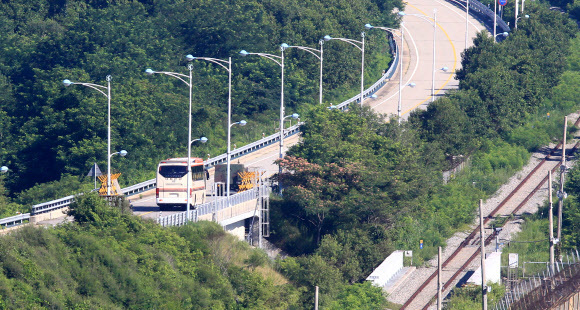 A group of South Korean officials left for North Korea on Friday to conduct a joint inspection of a highway along North Korea's east coast as part of an inter-Korean project to modernize and reconnect roads and railways over their border. They plan to visit the North again on Monday to check a 4-km stretch of road near the North's border town of Kaesong on the western line to supplement a joint survey that the two Koreas conducted in August. The two Koreas recently concluded an 18-day inspection of the North's railways in the western and eastern regions. The United Nations granted the railway inspection a sanctions waiver, ending monthslong delay in the joint work.